Over the past decade, Major League Baseball has attempted to drum up support for the All Star Game with a new democratic selection process and a “This Time it Counts” ad campaign, the later of which was more of an apology for 2002 than a groundbreaking statement. One of the more popular reforms gave fans the ability to select the starting lineups through a voting process. Managers would still be in charge of filling out their respective lineups, but MLB put its belief in the fans ability to find the balance between the most worthy and most popular. The league also started giving home field advantage in the World Series to the side that won the All Star Game in an attempt to improve the game’s meaning for the players and the fans. Ultimately, MLB sought to make the game more of a spectacle for the fans by empowering their control over the game. Some have derided the changes, claiming that the game is being made into a spectacle and popularity contest all while undermining the accomplishments of the higher seeded playoff teams. What seems to be the most striking is the lack of criticism for the undemocratic final vote competition. After the lineups are set and the league managers fill their remaining spots, the manager decides on which five players will go before the fans in a vote for the final spot. The winners this year were Freddie Freeman (1B-Atlanta) and Steve Delabar (RP-Toronto). But days before the All Star Game, Freeman injured himself preventing him from participating in the festivities. Bruce Bochy, the NL manager, then appointed his replacement, an action that undermines the premise of voting for the final spot. Anecdotally, Americans are most accustomed to voting in regards to political races. While there are many different rules regarding voting processes, we, as Americans, like to feel that our vote had a direct result in the eventual outcome. In single candidate races, it is expected that the top vote getter receive the position he was elected to. If, for whatever reason, he is unable to perform, then it is only fair for the second vote getter to step into his place. In the NL MLB vote, Bochy superceded this process and selected someone who wasn’t even part of the top five vote to begin with. As manager, Bochy should have authority over some roster moves, but he should not disregard the parameters that the MLB has set up in order to increase fan involvement. If MLB wants to legitimize the impact that the fans have on the All Star Game, it must honor the democratic elements of the “fan-vote”. Otherwise, the sport should recognize the limited amount of influence the fans actually do have over the rosters and rename the final man vote to a final man recommendation. As some of you know, both Ryan and I studied politics at Cal and now work in it in different capacities. Politics and baseball are some of the most interesting things to us, and we have noticed many ways that the two tend to overlap. For this reason, I am starting a new running series entitled “Politics and Baseball” that will hopefully be as entertaining for you as it is for me. Future themes will involve the use of political sabermetrics, which is a term I’ve been playing around with in my head for a while, but for right now I am going to write about how trades and deals that are made throughout the year between baseball teams reflect the way that deals get done in Sacramento or Washington. The NL West is all jammed up. All 5 teams are technically still in contention, with the Dodgers and Giants underperforming, the D Backs playing well, and the Padres and Rockies surprising some people. Because the standings are so tight, with the year half over, there is no clear “seller” or “buyer.” Everyone is still willing to make a deal that improves their team, and no team is looking to mortgage this season to start rebuilding for next year yet. So, with this backdrop, enter Ricky Nolasco. There are, of course, many pitchers that are rumored to be moving teams soon (Bud Norris, Jordan Lyles, Matt Garza, etc. ), but Nolasco represents a special case in that his contract is up at the end of this year, the Marlins have no hope of contending this year, and the Marlins have come out and said whoever takes on the rest of Nolasco’s contract can get him first without giving up top-tier prospects. 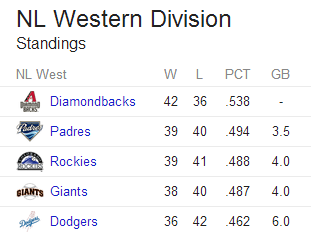 All 5 of the contending NL West teams (except maybe Arizona) need starting pitching help right now. The Giants rotation is not as vaunted as it once was, the Dodgers entered the year with 8 starters but are down to 3 or 4 capable ones at this point, the Rockies staff is performing well, but they need some help on the backend with no true ace, and the Padres have had their share of injury troubles as well. For these reasons, everyone in the NL West seems to be in on Nolasco, but his salary is not low (half a season at $11.5 million) and that his contract expires at the end of year making him just a rental, meaning that a team has to make a conscious decision that they are going to try and contend for this year before making a move for him. This is where money comes in handy. As in politics, money cannot win you a race alone, but it certainly helps. The Dodgers seem to still have money to burn from their lucrative TV contract and Magic Johnson trust fund, meaning they find themselves at an advantageous position. Though the Dodgers are technically in last place, they are only 6.5 games back of first, and thanks to their extra cash supply, they can afford to make a move for Nolasco now, blocking the other teams in the West. Assuming Nolasco does well, the Dodgers can simultaneously help themselves and prevent a good player from winding up on a rival. In California state politics, there is a June 30 filing deadline for all California legislative candidates. This deadline marks the first time that a candidate discloses how much money he/she has raised. Besides keeping them honest, it is there to show viability and give an idea of who the frontrunners in a race might be. By making a move for Nolasco now, the Dodgers can show viability that, despite their place in the standings, they are a contending team and one that intends to do everything possible to get to October. In the same way that a political candidate can dissuade other challengers from running by starting off strong with lots of donations and endorsements, so can the Dodgers dissuade some of the other teams in the West, such as the Padres and Rockies, from getting too confident in their current position and making moves that might improve their club before the deadline. Obviously, it will be tough to dissuade the Giants from contending in the same way that an incumbent who is down in the polls would still want to run for re-election. Still, wrapping up early endorsements from star players can definitely help improve your chances. There is a lot of campaign left, and the race is still wide open, but whichever team makes the move for Nolasco the soonest gives themselves a huge advantage for the rest of the year. It is low-risk in that Nolasco is a proven innings eater and that the Marlins have said they won’t require big-name prospects in exchange. And more importantly, the longer Nolasco is on a team other than the Marlins, the more chances he has to help that club. He is wasting wins on the Marlins currently, and the sooner a team goes out and gets him, the sooner he becomes a productive member of that team and starts generating wins. This type of move should be made more often in the major leagues, but many teams are risk-adverse and like to wait until the trading deadline when they have a clearer picture. For just this reason, the Dodgers, or any other team in the West that is willing to take on his contract, can improve themselves now by trading for Nolasco. This will give the team that gets him the best chance of making the playoffs, while dissuading other candidates from running. Whichever team makes a conscious effort to improve themselves first puts themselves in the best position to contend in October. My bet is the team that goes out and gets Nolasco now will be the one you see in the playoffs come seasons end.